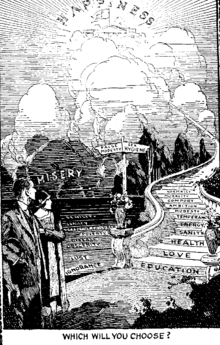 The social hygiene movement of the late 19th and early 20th centuries was an attempt by Progressive-era reformers to control venereal disease, regulate prostitution and vice, and disseminate sexual education through the use of scientific research methods and modern media techniques. A mental hygiene movement also developed, partly separately and now generally known as mental health, although the older term is still in use, e.g. in New York state's law. The social hygiene movement represented a rationalized, professionalized version of the earlier social purity movement. Many reformers, such as Marie Stopes, were also proponents of eugenics. Inspired by Charles Darwin's theory of natural selection, they argued for the sterilisation of certain groups, even racial groups, in society. Indeed, by the 1930s thousands of forced sterilizations of people deemed undesirable took place in America and other countries each year. This continued for several more decades in some countries, though after 1945, the movement was largely discredited. The American Social Hygiene Association was formed in 1913. It was later renamed to the American Social Health Association and, in 2012, the American Sexual Health Association. ↑ Simmons, Christina (July 1993). "African Americans and Sexual Victorianism in the Social Hygiene Movement, 1910-40". Journal of the History of Sexuality. 4 (1): 51–75. JSTOR 3704179. ↑ Encyclopedia of Children and Childhood in History and Society: Hygiene JACQUELINE S. WILKIE.